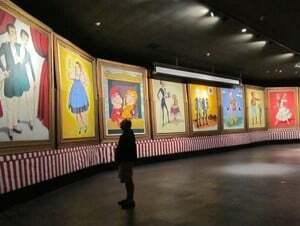 Ladies and Gentlemen, step right up and discover the rich history of “The Greatest Show on Earth.” The best place to do that is at The Ringling in Sarasota, Florida. Located on the former estate of John and Mable Ringling, are three major attractions— the opulent Ca’ d’Zan, the impressive Museum of Art, and the fun Circus Museum. One ticket provides access to all, as well as to the beautiful Bayfront Gardens. The property is located on scenic Sarasota Bay and brings to life the Golden Age of the American Circus (1870-1938) and the Ringling family. 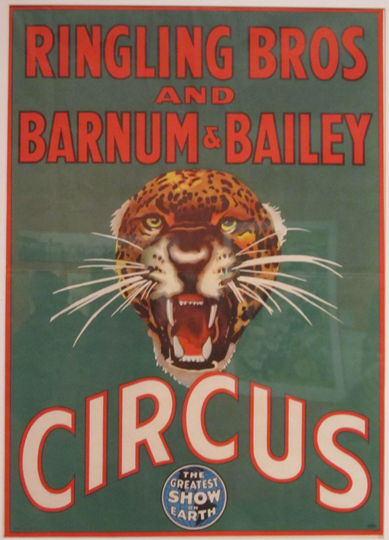 collection of original circus posters and flashy costumes, but you’ll see ornate rolling animal cages and bandwagons, John Ringling’s private train car, and the world’s largest model circus. 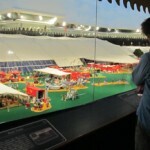 Built over 50 years by master model maker Howard Tibbals, the detail of the three-quarter-inch-to-the-foot scale replica of the Ringling Bros. and Barnum & Bailey Circus is astonishing! Every tiny nuance of the circus has been captured in miniature. Plan to spend a couple of hours inside museum— it’s filled with a dazzling amount of rare memorabilia and information. with Sarasota Bay serving as her Grand Canal. She got exactly that—a five-story, 36,000 square foot mansion with 41 rooms and 15 bathrooms. Tours of the decadent Ca’ d’Zan (“House of John” in the Venetian dialect) covers the first floor (or pay extra to see the entire house). The kitchen is probably the only room that isn’t carved, decorated, or gilded from floor to ceiling! Although $1.5 million doesn’t seem overly extravagant for a mansion by today’s standards, it was a staggering sum to pay for a home when it was completed in 1926. Soon after the Ca’ d’Zan was completed, the Ringlings built a 21-gallery museum modeled on the Florentine Uffizi Gallery. The museum was need because their home could not hold the treasure trove of paintings, tapestries, furnishings and art objects that the couple had collected on their annual trips to Europe. Works by the Old Masters, including Velazquez, Poussin, van Dyke and Rubens hang in the impressive museum. The courtyard is filled with replicas of Greek and Roman sculpture, including a bronze cast of Michelangelo’s David. 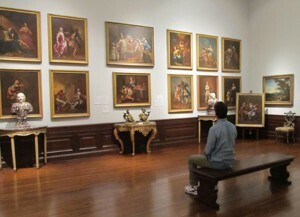 Established as the legacy of Mable and John Ringling for the people of Florida, a visit to the Ringling is both entertaining and educational. Just step right up and be amazed! Adult admission is $25 (discounts for seniors, students, military) and includes entry to the Museum of Art, Circus Museum, first floor of the Ca’ d’Zan and Bayfront Gardens. Complimentary guided tours of all three are included, based on availability. 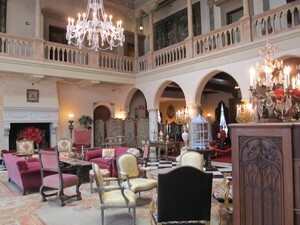 Guided tours of the upper floors of the Ca’ d’Zan are available for an additional charge. 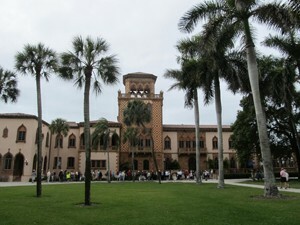 The Ringling is open daily 10:00am – 5:00pm, Thursdays until 8:00pm. Ca’ d’Zan is not open after 5pm. The Bayfront Gardens are open from 9:30am until 6:00pm Closed on Thanksgiving, Christmas and New Years Day.